Know where you want to go? Use this menu for direct access to all major pages. 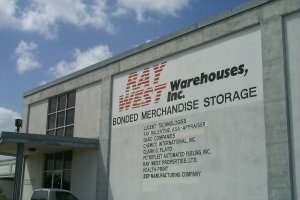 Services of Ray West Warehouses, Inc., a bonded merchandise warehouse. Services of affiliate Ray West Properties, Ltd., a development and property management company. What’s new at this website and at the Ray West companies. Welcome...to the web site of Ray West Warehouses, Inc., providing full-service warehousing in south Texas since 1953, and its affiliates, Ray West Transport and Ray West Properties, Ltd.
With over 300,000 square feet of storage space (with burglar alarms and fire sprinkler systems) conveniently located in a foreign trade zone in Corpus Christi, TX, right off of IH-37, just minutes from Corpus Christi International Airport and the Port of Corpus Christi, Ray West Warehouses is easily accessible for all of your storage needs. Should you require specialized facilities of your own, Ray West Properties, Ltd. can work with you to develop them and assist in their management. © Copyright 2005, 2008 Ray West Warehouses, Inc. All rights reserved. Last updated Saturday, January 05, 2008.